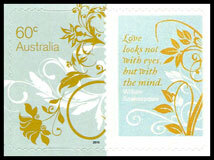 New greetings stamps were be issued on 19 July, and will also be offered for the personalised stamp service. 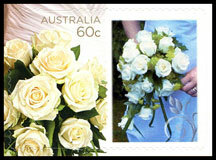 The stamps offer a full range of designs suitable for all events from new babies to weddings, along with a corporate designs. 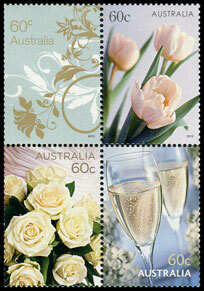 The Wattle, Balloon and Teddy bear stamps were printed in strips of 3, the Southern Cross stamps in pairs and the Floral graphic, Tulips, Roses and Champange glasses in blocks of 4. 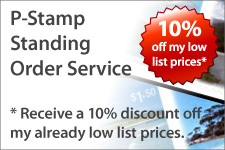 Only the $1.20 stamp was printed in individual sheets. 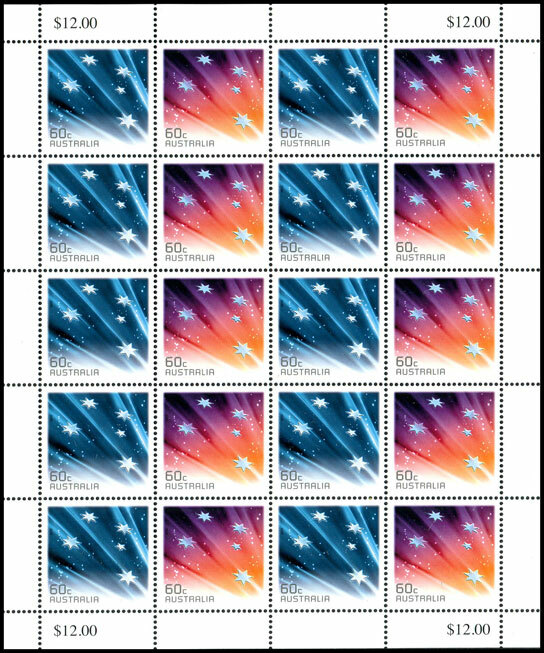 The Bulletin gives incorrect information about the sheet size for the Southern Cross stamp. 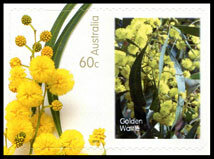 Unusually this stamp was issued in small sheets of 20 stamps (4 x 5). Given the size of this sheet it is quite collectable, and collectors of sheets might like to include it in their collection. 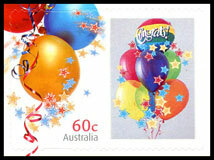 The Balloons, Roses, Tulips, Teddy bear, Wattle and Wedding Bands designs were also issued in self-adhesive booklets of 10. 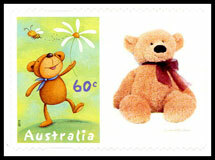 * Phosphor frame on Teddy Bear, 'L' shape along right and bottom on Balloon, all others have an 'L' shape along top and right. 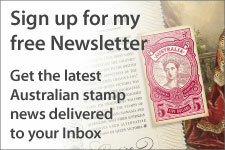 Each booklet Booklets will be distributed to post offices in chequebooks of 20 booklets. These are not listed on this website. 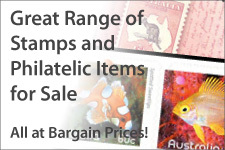 All the 26 mm x 37.5 mm stamps will be available through the Personalised Stamp (TM) service. 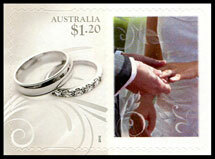 Below are sample images of my personalised stamps. 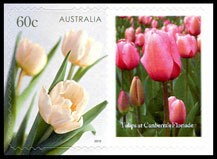 Nine maximum cards were released with this issue, with each stamp given its own. 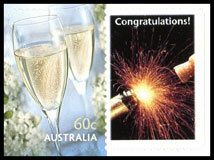 The only exception was the Southern Cross pair which was placed together on a maximum card.